It was nice of Microsoft to not just swear off the Xbox 360 completely (like it did with the OG Xbox...) now that the Xbox One is out, but if the Xbox 360 version of Forza Horizon 2 is their idea of support, they might have been better off letting it fade away gracefully. Forza Horizon 2 on XONE is amazing and one of the best racing games ever. Forza Horizon 2 on Xbox 360, on the other hand, is a waste of shelf space. Not just because it doesn't compare to the XONE version, which no one really should have expected, but because it isn't even as good as the original Forza Horizon. What is different in the Xbox 360 version of Forza Horizon 2? Well, for starters, the graphics are ugly. Really, really ugly. The cars look okay, and the game looks decent while in towns, but drive out into the countryside and the game gets hit with the ugly stick. There is no lush foliage to drive through here, just empty, bland, open space with ugly ground textures that stretch for miles. There are also no weather effects on X360, but there is a day/night cycle. The game is shockingly ugly, though, if you're used to the XONE version. Oddly enough, it also looks worse than the original Forza Horizon, even though it uses the same engine and is essentially a European re-skin of the first game. I went back and played the original game for a while just to make sure my memory wasn't faulty. Nope. It absolutely looks better than Horizon 2. What Is Different in Forza Horizon 2 on Xbox 360? Horizon 2 360's next flaw comes in that the cross-country races and driving across fields and stuff that were a big attraction in the XONE version are nowhere to be found here. Instead, there are straight up fences and walls all over the place, and even fields that you can drive into have a wall in the middle. Not that you'd want to actually drive through these areas in this version anyway, though, because that's where the ugly graphics live. And you don't want to see those. Horizon 2 on 360's career progression is also radically different from the XONE version. Each of the six cities in the game has 8 events, for a total of 48 races. That's it. There are ten different vehicle classes that you can run those 48 events in, which technically bumps the total up to 480, but they are still the same events over and over and over again, just in different cars. You only have to beat the 48 events once each to become the Horizon Festival champion, and you can actually do them all in one vehicle and never change cars at all, if you don't want. And because there are no cross-country events, all of the events are circuit and sprint races. There are also only four showcase events (you know, where you race a train or airplane or something) and these are different from the events on XONE. There are also 30 Bucket List challenges on 360, which are also all different from their XONE counterparts. You'll find ten barn finds here as well. And there are 150 bonus boards hidden around to find. Unlike the XONE version that will take 100+ hours to finish, the 360 version can be completed in a few hours (unless you actually want to run every event 10 times). The map is also slightly different on X360 compared to XONE. The port in the lower right corner of the map? Inaccessible. The airport with the speed trap at the end of the runway? Inaccessible. The cool mansion with the windy roads all over (and underneath it)? Not present here at all. The rest of the map is fairly close, though, and many of the roads are exactly the same. Interestingly, the 360 version has a slightly different car list and actually has some cars not present in the XONE version (and likewise there are XONE cars not found here). There are no tuning options on 360, which is odd. You can still upgrade to a different class and stuff, just not actually tune performance. The 360 version will also have no DLC at all, which is sort of good, on the one hand, but also a slap in the face. Another big thing missing here are drivatars, which are an XONE only feature. Racing bland ol' AI just isn't as fun as racing drivatars. Also, there are only 8 cars per race, compared to the 12 on XONE. 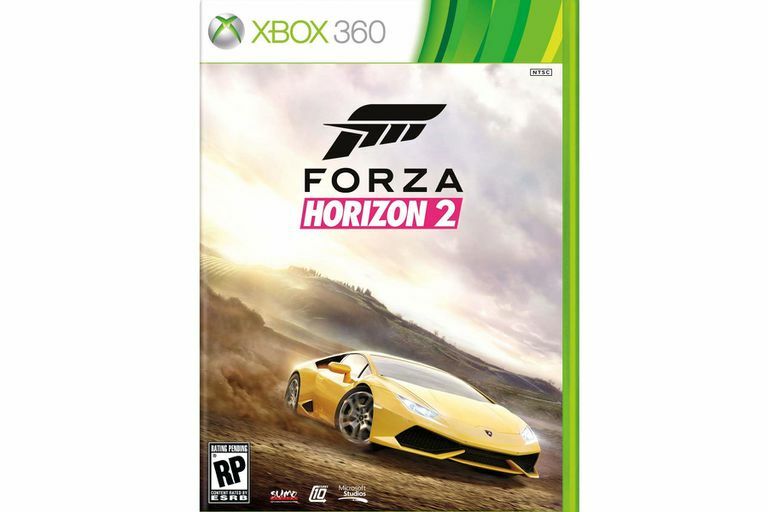 Okay, with all of those differences out of the way, how does Horizon 2 on 360 actually play? Not too badly. The handling model is the same as it was in Forza Horizon 1, which means it is more arcadey and slippery than the XONE version. You feel really stuck to the road and in control on Xbox One, but on 360 (in Horizon 1 also) you're sliding all over the place and feel less in control. It took a bit to get used to this style again, but it was enjoyable. But then you'll run into weird stuff that happens just here. There are glitches where you'll run into invisible objects (even during races) that bring your car to a complete stop, or your car will flip (yes, even during races) for no apparent reason. The physics are wonky here. The skill system is also pretty well broken on 360 as it doesn't chain stuff together smoothly like you can on XONE or in the first game. The skill system is a solid 5+ seconds behind what you're actually doing, which is just laughably terrible. The game also doesn't pay many credits for winning events, and upgrades cost a lot (seemingly a lot more than the XONE version). A lot of these criticisms and comments have to do with direct comparisons to the Xbox One version. What if you don't have an Xbox One, though, and don't care about the differences and just want a new racing game? In this case, Forza Horizon 2 on 360 isn't as bad, but still not very good. The driving model is fine, but the lack of variety in the events will wear on you after a while. Other aspects of the game, such as showcase events and barn finds, as well as the game world itself, are less interesting than the original Forza Horizon. Nothing is really improved over the original here. Everything is either the same or worse than it was two years ago. And the graphics are noticeably worse in Horizon 2. Without a doubt, Forza Horizon 2 on Xbox 360 is the worst game to carry the Forza title. It isn't even in the same league as the XONE version (not that we expected it to be), and it doesn't even compare all that favorably to the original Forza Horizon on 360. It is ugly and glitchy and is missing features and the career progression is bland. Microsoft would have been better off not releasing this dud, and it is a shame they had to drag Sumo Digital's good name through the mud to do it (who I don't blame at all for this mess). Even if you're a die-hard race fan and want something new to play on 360, I would have to recommend you skip the Xbox 360 version of Forza Horizon 2. It just isn't very good. Did You Know that You Can Watch DVDs on Xbox 360?